licia Whitney and Alexander Dale, the team behind the Sea Legs Wine Bar in Huntington Beach, have opened a second location just a few blocks away. This one is called the SeaSalt Woodfire Grill, and it features lots of delicious meats grilled over red-oak wood, Santa Maria barbecue style. The motto is "farm to fire." The room is quite attractive with reused wood flooring, upholstered chairs and leather banquets, as well as tall tables in the bar area and more tables on the heated patio. The bar area features a wall of white tiles. The main feature of the décor is one huge floor-to-ceiling mural depicting all kinds of meat. The servers wear shirts that say "Smoke meat every day." My dining companion and I had, for an appetizer, pork belly mac and cheese, which could have been an entrée. It was a nice size, with delicious, fat al dente noodles, really good cheese that didn't taste like the kind you get in a box, and big hunks of pork belly that had been cooked in the wood-fired grill. The belly was especially delicious, with very little fat and a light char. Our next selection was a plate of big prawns. They were good but needed a bit of sauce or something to bring out the flavor of the seafood. They came with a side of Santa Maria pinquito beans and salsa. Crusty garlic bread also came on the side. We also had the creamed spinach, which was served with very crispy fried onions. Our other entrée was the 10-ounce Spencer steak, which was tender with lots of meaty flavor and a nice char. It was served just the way we like it, with the outside charred and the inside red and juicy. 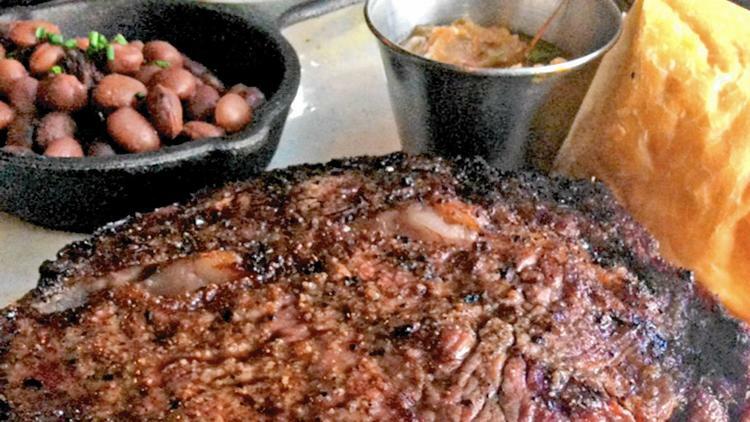 The SeaSalt Woodfire Grill also features tri tip, filet mignon, New York strip and a 28-ounce bone-in rib eye. Also available are the Pacific albacore steak, a surf and turf dish, half a Jidori chicken and a 16-ounce bone-in pork chop. You may ask for the selection of house-made finishing salts — there are eight to choose from, including the chipotle lime salt, Black Diamond volcanic salt and signature Santa Maria salt. All dinners come with Santa Maria pinquito beans, salsa and garlic bread. Add a house salad for $4. For dessert, the restaurant offers Omar's Og Pudding, Central Coast strawberry shortcake, scorched s'mores brownies and vanilla ice cream with Central Coast olive oil and topped with black lava salt. We were debating which to order, but after the very hearty meal, we wanted something a bit light and chose the strawberry shortcake. Atop three big pieces of dense short cake rested a big scoop of very good, rich vanilla ice cream, a mound of whipped cream and fresh strawberries. Surrounding it all was fresh strawberry syrup sauce, which was also drizzled on the ice cream. If you are looking for something even lighter, SeaSalt offers a menu of "plates" — smaller portions such as the SeaSalt chowder with smoked albacore, lobster and corn; four sandwiches; and a large selection of side dishes. This is going to be a successful spot, but it does get a bit noisy in the evening, although that seems to be popular these days.